This tropical treat has the perfect fruit-to-veggie ratio, which makes it a great beginner-friendly green smoothie. The spinach has a mild taste and is packed with over 20 different nutrients, vitamins, minerals, antioxidants and high-quality amino acids. Barley grass contains more than 70 food-state nutrients and has high levels of chlorophyll, making it extremely alkalising and an excellent detoxifier. Use at least one frozen fruit to chill your smoothie – for example frozen mangoes or bananas – otherwise add three ice cubes. 1. 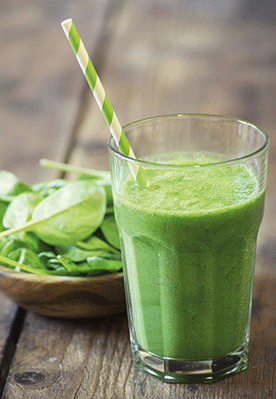 Tightly pack two cups of leafy greens in a measuring cup and then toss into a blender. 2. Add water and blend together until all leafy chunks are gone. 3. Add the barley grass, mango, pineapple and bananas and blend again until smooth. 4. Pour and drink straight away. Even the kids will love it!